I could still hear the cacophony of purchasers in the gift shop as I got down on all fours to inspect Ai Weiwei’s first installation in the Royal Academy in London. 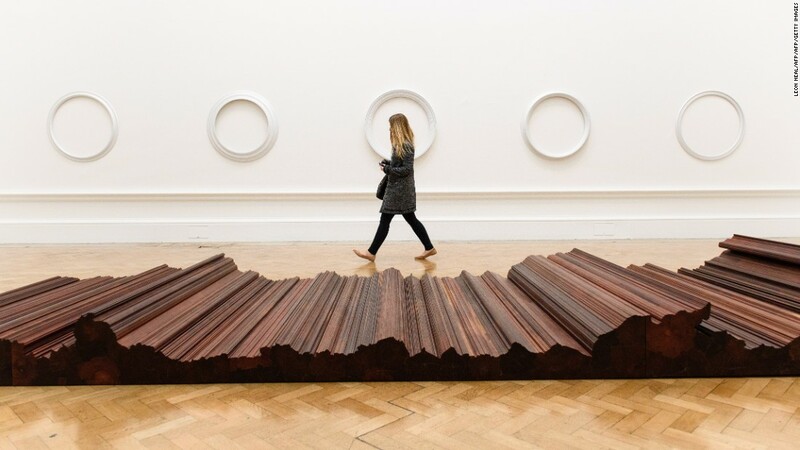 Bed (2004) arrives as a series of fluted corrugations carved into ironwood unravelled across the length of the room. Made from beams reclaimed from destroyed Qing dynasty temples, Bed is an enigma you must study close up in order to locate its logic. Like an unfastened necklace, it displays China’s border as a three-dimensional line. If it were a map of Colorado, Bed would be a cube. Ironwood’s grain is sometimes deep brown, like dried blood, or pale like honey, and its rings are barely visible, as are the joins rendered by Weiwei’s workforce of skilled carpenters to fit this puzzle together. China’s topography is knotty and convoluted. Bed is almost too daunting to hold in the imagination as a single idea. But I get the impression that this is the map’s purpose. This is Ai Weiwei’s China. When Ai Weiwei was a boy growing up in the decade of Mao Zedong’s Cultural Revolution, there were no artists, only ‘art-workers’, whose skills were deployed to make propaganda posters: portraits of a radiant Mao casting beatific beams of light on Chinese men and women, who salute their leader as they toil in the field or gather in the home. Subsequently, Bed is more than an impressive sum of its composite parts; it is a showcase of China’s traditional craftsmanship that has survived the rise of mass manufacturing, deployed this time for art’s sake. In the sculpture room is a grass lawn made from marble, each blade finely honed. In the middle sits a life-sized child’s buggy, uncannily authentic and eerily empty. The marble is chiselled with such practice that it falls like fabric. On the periphery of this centrepiece are more marble sculptures of modern objects including Surveillance Camera (2010), pertaining to the scrutiny Weiwei’s studio in Beijing is still under. There is an atmosphere of disquiet as visitors move around the objects, as if they themselves are being watched. These pieces are symbolic of the human rights abuses Weiwei has been subjected to, at the hands of the State Council: first monitored and tracked by private investigators (he was followed whilst taking his baby son for a walk in the park, hence the buggy on the lawn), then put under house arrest during the demolition of his Shanghai studio in 2010. The following year he spent 81 days in solitary confinement under the auspices of the Chinese State guard. Politics and art have always had a problematic relationship, in the sense that the latter feeds off the former. When art submits to politics, art is propaganda. And when their union is palpable, the reproach loud and clear, art is renamed activism. Weiwei, however, is in pursuit of a bolder demand: could the State Council ever surrender to the critical messages integral in his artwork? Can his artwork change the world? The exhibition’s biggest gesture in its call for change is Straight (2008-12), a room dedicated to the children who perished in the 2008 Sichuan earthquake. In the middle of the space are thousands of rebar rods Weiwei and his team collected from the wreckage: cheap steel that the State Council used to build China’s schools. His team hammered each snarled rod back into their original – straight – forms. The school buildings and their occupants stood no chance in an earthquake, and it was Weiwei’s quest to expose the State Council’s failure to protect its children that first got him into trouble. The scene I remember from the footage playing in that room is of a small, dust-covered body being given frantic chest compressions by a rescue worker. Was this too much information? Western culture likes its modern art to house big ideas with brevity. John Ruskin, the Royal Academy’s founder, said just as much: ‘Say all you have to say in the fewest possible words, or your reader will be sure to skip them.’ When it comes to culture, European audiences expect to do some of the work themselves – an expectation that might be interpreted as arrogance. Ai Weiwei is frequently criticized for the lack of ambiguity in his work. But the impression I get from Weiwei’s exhibition is that there is simply not enough time for ambiguity. Only artistic confrontation on a titanic scale can match the magnitude of the problem: the human rights abuses that he declares are still pervasive in China. Coincidentally, Weiwei’s exhibition overlapped with President Xi Jinping’s state visit to the UK, which opened up further dialogue on China’s human rights track record. Depth is not about subtlety in Weiwei’s work, but bound in the atavistic nature of the raw materials he selects to speak out on modern China. Weiwei goes down through time in order to confront us with the present. Tradition and antiquity – those deep notions we hold so dear and build cathedrals of culture to – are violated by Weiwei on such a grandiose scale that he draws us into each turn of the sculptor’s tool: a marble lawn, a ton of tea, an exquisitely rendered map made of temples. Ai Weiwei’s artwork is efficacious in its immediacy, and it is the skill in the execution of ideas that keeps visitors lingering there, contemplating each riddle. Each piece is an investigation of scale; he makes something colossal in both idea and form, from manifold minute deeds. It is an attention I think John Ruskin would approve of. ‘He who takes no interest in what is small,’ Ruskin said, ‘will take false interest in what is great.’ Had the schools been made with equal care and attention, 5,335 children might have survived the earthquake. Hannah Garrard is a nonfiction writer and youth worker from Britain, whose writing focuses on community narratives.